Vodder Manual Lymph Drainage (MLD) is a highly specialised form of massage, which uses light, rhythmical, very precise hand movements, pressures and sequences designed to stimulate the lymphatic vessels and encourage the flow of lymph fluids. The massage works at a skin level to influence the direction and speed of lymphatic flow, redirecting if necessary. Increased circulation, assists in detoxifying the body and support our health through a better functioning immune system. It has the beneficial effect of removing toxins, waste material and excess water from the body’s tissues. it also has a calming, relaxing effect and influences the body’s immunity. One of the key functions of the lymphatic system is to keep the tissue fluid clear of disease-causing toxic substances, which makes this a system of utmost importance for our health and well-being. The lymphatic system is similar to the circulatory system; it has just as many vessels throughout our body’s organs and tissue. However, this system only drains in one direction and does not have an active pump, such as the heart. Therefore, the hollow structure relies on exercise, movement, manipulation and deep abdominal breathing to remove the polluted fluid from our bodies. Lymphatic organs include the spleen, the thymus, tonsils, bone marrow and lymph nodes. The liver is also strongly involved in cleansing our system. Lymph nodes are bean-like filter stations. 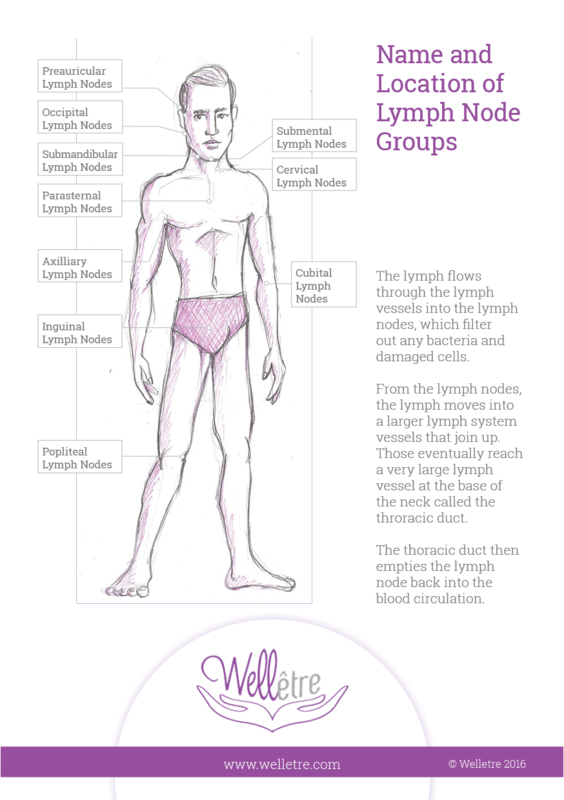 Larger concentrations of lymph nodes are found in the neck, armpit, groin and intestinal areas. These glands are responsible for breaking down bacteria and debris. Man “is an amphibian”. ‘Even the most beautiful feminine body is no more than an aquarium with 50 litres of lukewarm seawater in which trillions of cells live and fight for survival.’ Professor Oliviero – biologist. Dr Emil Vodder and his wife Estrid devoted their lives to manual Lymph Drainage (MLD) and its dissemination. They completed the elaboration of MLD method in France during the years 1932-1936 and were unable to write a book until forty years later. They’ve travelled around Europe for many years, holding lectures and courses to explain the structure and functions of the lymph system by means of drawings and manuals. Needless to say, the scientific world was not yet ready for their findings and would not accept their hypothesis and empirical evidence. The lymph system was an unknown factor in the field of physical therapy, an unexplored and dangerous no-man’s-land. It was considered unadvisable to massage the lymphatic nodes since it was thought that the treatment would spread bacteria and viruses. Children with swollen nodes in the neck, for example, were operated on to remove the nodes. Appendicitis and spleen operations were also carried out without considering that, in so doing, the defence mechanisms of the body could be impaired – a hypothesis that later research proved to be true. Now its efficacy is no longer doubted and it is practised in many locations worldwide. Interested in finding out more about Vodder Manual Lymph Drainage? You can read further on The Vodder technique and Dr Emil Vodder’s life. Some of the descriptions above have been taken from Dr. Vodder’s Manual Lymph Drainage’s textbook. Please Note: MLD is not intended as a substitute for medical advice or treatment. If in doubt please consult your doctor.